Avoid congestion and snoring by making one of these nasal inserts, much cheaper than the store bought kind.This guide has instructions for a DIY nasal breathing insert. Those adhesive strips (to help better breathing) didn't work for me. I made my own devices instead. This is heavy rubber tubing from the hardware store; I use 5/8 inch (exterior of tube) diameter. At some stores, you can buy from a roll for only what you need. At "big box" stores, you might have to buy a long length of tubing. Cut a 6 inch piece (or larger/smaller), and put it in boiling water for just a minute or two. After removing from the water, it will be pliable and easy to cut. 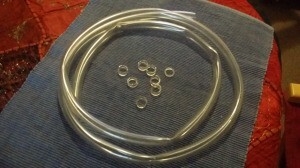 Cut, with scissors, into approx 1/4 inch circles; you can get quite a few from 6 inches of tube. One, inserted barely into a nostril, will do amazing things to open air passages. I use two if I'm especially "stuffy', though one usually works fine. I've used these for several years, and have never experienced one going "too far up my nose". Yes, it can look a bit odd, though most of the time I'm sleeping, no one is looking up my nose! Obviously, these would not be good for little children, since the circles would be easy to swallow. Use and reuse. Great for travel, too! Sounds as if it should work well. I'm amazed at some of the very simple, yet ingenious ideas people come up with. Curious, though. Is that tubing rubber or maybe a type of silicone, which would probably be safer to use? Hmmmm...good question. I think it must be a type of silicone, or whatever material is used, now. I found mine at a local hardware store that sold by the inch, rather than in a large quantity. Soaked longer pieces (maybe 6 inches) in boiling water for a moment, then removed and cut into 1/4-ish inch cross-cut pieces. Pretty rigid once it cools; sure works for me! I use a product from WoodyNose.com. It works but often slips out from one of the nostrils. I'll have to find some of your tubing and give it a try as I wear the nasal dilator during the day, mostly.